By Chris Williams: We have about a month to go before the third fight between Manny Pacquiao and Juan Manuel Marquez on November 12th, and Pacquiao is acting really worried about this fight unlike any I can remember Pacquiao being in. Pacquiao is reportedly training like a workhorse, and is really tearing into his sparring partners like never before. Then there’s rematch clause that was put in the contract with Marquez, something that will make it necessary for Marquez to give Pacquiao a rematch if he somehow beats him. It’s hardly necessary, though, because with the big money that Marquez is getting for this fight, he’ll gladly fight Pacquiao immediately in a 4th fight between them just for the big payday he’d be getting. When Pacquiao arrived in the U.S from the Philippines to start his training at the Wildcard gym owned by his trainer Freddie Roach in Los Angeles, California, Pacquiao immediately started sparring on the first day instead of relaxing like he usually does with a light work out after a long flight. Everything about this fight suggests that Pacquiao is really worried about losing to Marquez.I can certainly understand Pacquiao not wanting to lose, but working yourself to the bone isn’t the answer. Pacquiao won’t have much left if he keeps working out so hard, and he’ll end up making things easy for Marquez by winding up over-trained. The last thing we need is Pacquiao so overworked from worry that he goes out and gets beaten up by Marquez. I don’t want Pacquiao and/or Roach coming up with a bunch of excuses if things don’t work out because he’s over-trained for this fight. 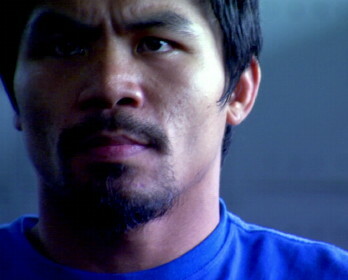 Pacquiao isn’t talking like he’s done in other training camps, and seems to be deathly serious about this fight. There’s no joy, and just reminds you of someone that is tackling some math homework.